Baby/Sadie - Diamond in the Ruff Rescue & Rehab, Inc.
e in the moment. We are looking for an adopter for Baby who understands that her past is behind her, and her future is bright. She just needs someone with enough patience to allow her time to adjust. She will bond completely with her adoptive family, and will be a lifetime companion for a very lucky forever home. Baby has finally found her forever home and has been renamed Sadie! After a few nights of acclimating to her new surroundings and new owner, she has made steps to come out of her shell. Sadie is now the proud owner of a huge, comfortable dog bed and will live the rest of her life in complete security. She has come to terms with her surroundings and loves playing with the kids next door, and is getting less fearful of walks. 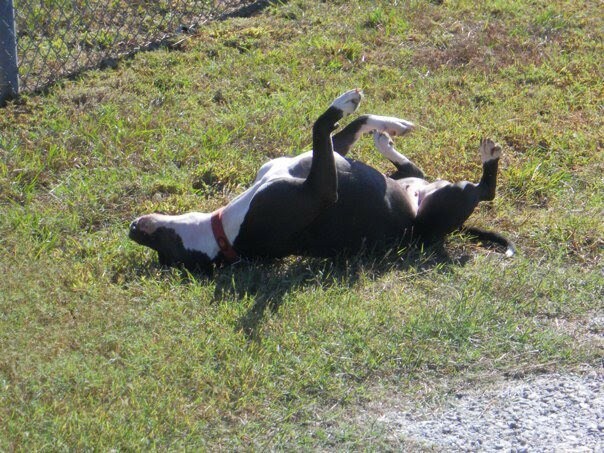 Sadie's new owner writes: "It's been one year since I brought Sadie home with me. One fantastic year since she went from scared dog who cowered at my front door to proud service dog who, when not in her vest, romps at the dog park happily chasing other dogs, or when in my neighbours yard defends it vigourously from invading squirrels. One year ago today she had to be carried into my car by her former foster mom. One year ago today she stared at me, cowering at my front door, afraid of me, my house, everything. Today she does her “happy dance” every time we take a walk. Her happy dance consists of her rolling on the ground with a smile on her face then getting up and running quickly, turning back to me then running towards me, wagging her tail and showering me with kisses. We go on hikes without a leash because she never gets to where she cannot see me. She's my service dog because she stops debilitating anxiety attacks before I even know they're coming on. She walks around proudly with her vest and she even fought (and won!) her battle with her old nemesis the shopping cart (she also won her battle with her arch-rival the ceiling fan – both fears conquered!) Now we are working on her fear of buses, but with her anxiety vest she even takes treats from me while on the bus, so I have a feeling that she'll conquer that fear in no time at all. Right now (without her vest) we are in advanced dog training classes because I want Sadie to get her Canine Good Citizenship certificate. Anyone who's ever met her knows that she's already a good citizen, but as a pittie she has an uphill battle. As my service dog she has to be let into any apartment, even non-dog apartments, but I want an extra layer of protection. I also want another accomplishment to brag about my dog. Oh yeah, did I mention she took best rescue at an ABKC show? Well she did, and we'll be going to more shows, and they're even making a category for rescues so she will be a registered show dog. How cool is that? Right now she's pulling on me to go inside to go to class – I swear my dog loves to go to class more then I do, which is cool, because I need her to be excited about these things. But yeah, this is where Sadie is a year later." Sadie and her story post-adoption has been published online! Click HERE to read it.